When you think data plate you probably think of a piece of metal with numbers hooked to the outside of your mobile home. 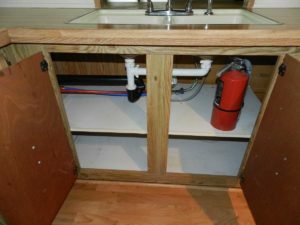 ​There are small plates hooked to the outside of mobile homes near the back. 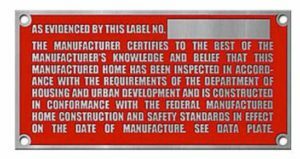 However, these are referred to as Hud tags or Red tags and they do very little to tell you about your mobile home. One of the most important parts of information that you will find on this sheet is on the top left corner. Here you will find who manufactured your mobile home. You can also find the year of the mobile home and the serial number or vin number. This data plate is important if you happen to lose the title because if you lose the title the only way to find out the serial number is with this paper. So, it will help you in identifying your home. If you don’t have a title and you can visit your local bureau of motor vehicle or secretary of state. They use the serial or vin number to look up your home and show who the ownership is under. This is the same way you would look up your car, truck or motorcycle. These “data plates” are usually located on the inside of kitchen cupboards. They are sometimes located on the walls of walk in closets in bedrooms. Data plates may sometimes be on the inside of power boxes but that is rare. I usually find them under the sink on the inside of the kitchen cupboard door. Rarely, these papers have been removed from the home by owners because residents simply do not know what they are. Someone might have remodeled the mobile home and simply thought that this piece of paper wasn’t important. The information on these data plates also illustrates information about the roof. It will tell you: how much snow it can handle. On the illustration below you will see a map of the United States with the number 20 PSF, 30 PSF and 40 PSF. This tells you how much snow a roof can handle per square foot. 20 being the weakest and 40 being the strongest. 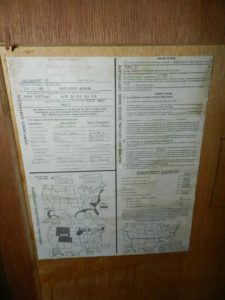 The data plate also gives information about the walls of the mobile home. It will tell you if they are 2 x 4 or 2 x 6. This is again important if you live in a hurricane area and can help your local building inspectors decide if the home is up to code for that area. 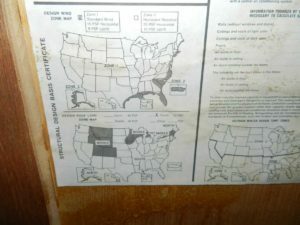 These papers can provide a lot of great information so they should be left in the mobile home and not removed. One of the key things that you can find on a data sheet is the serial number. Also you will find the manufacturer of the mobile home and the year the home was built. 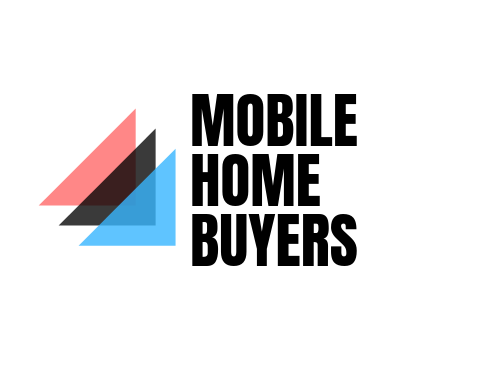 This might not sound so important but if you do not have the title to the mobile home this can be a key piece of information to help you get that title back! If your home doesn’t have a data plate you can contact the Institute for Business Technology and Safety also known as IBTS you can simply visit their site here IBTS. They may be able to help you obtain a copy of your data plate if it is missing.